More a philosophy than a religion, Confucianism has nevertheless become intertwined with Chinese religious beliefs. With the exception of Mao, the one name which has become synonymous with China is the Confucius (Kongzi). He was born of a poor family around the year of 551 BC, in what is now Shangdong province. His ambition was to hold a high government office and to reorder society through the administrative apparatus. At most he seems to have had several insignificant government posts, a few followers and a permanently blocked career. A the age of 50 he perceived his divine mission, and for the next 13 years tramped from state to state offering unsolicited advice to rulers on how to improve their governing, while looking for an opportunity to put his own ideas into practice. That opportunity never came, and he returned to his own state to spend the last five years of his life teaching and editing classical literature. He died in 479BC, aged 72. 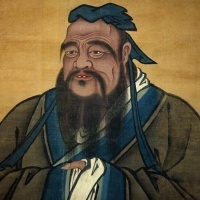 The glorification of Confucius began after his death. Mencius (372-289BC), or Mengzi, helped raised Confucian ideas into the national consciousness with the publication of The Book of Mencious. 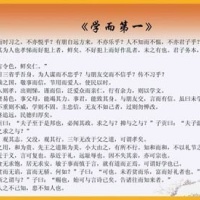 Eventually, Confucian philosophy permeated every level of Chinese society. To hold government office presupposed knowledge of the Confucian classics, and spoken proverbs trickled down to the illiterate masses. During the Han Dyansty, Confucianism effectively became the state of religion - the teachings were made the basic discipline for training government officials and remained so until almost the end of Qing Dynasty in 1911. In the 7th and 8th centuries, temples and shrines ere built in memory of Confucius and his original disciples. During the Song Dynasty, the Confucian bible, the Analects, became the basis of all education. It is not hard to see why Confucianism took hold in China. Confucianism defines codes of conduct and patterns of obedience. Women obey and defer to men, younger brothers to elder brothers, and sons to fathers. Respect flow upward from young to old, from subject to ruler. Certainly, any reigning Chinese emperor would quickly see the merits of the encouraging such a system. All people paid homage to the emperor, who was regarded as the embodiment of Confucian wisdom and virtue - the head of the great family-nation. For centuries administrations under the emperor lay in the hands of a small Confucian scholar class. In theory anyone who passed the examinations qualified, but in practice the monopoly of power was held by the educated upper classes. There has never been a rigid code of law, because Confucianism rejected the idea that conduct could be enforced by some organization; taking legal action implied an incapacity to work things out by negotiation. The result, however, was arbitrary justice and oppression by those who held power. Dynasties rose and fell, but the Confucianism pattern never changed. Indeed, is still holds true in today's China. The family remains its central place as the basic unit of society; Confucianism reinforced this idea, but did not invent it. The key to family order is filial piety - Children's respect for and duty towards their parents. Teaming up with traditional superstition, Confucianism reinforced the practice of ancestor worship. Confucius himself is worshipped and temples are built for him. The strict codes of obedience were held together by these concepts of filial piety and ancestor worship, as well as by concept of 'face' - to let down the family or group is a great shame for Chinese. Confucian temples, statures and Confucianists themselves took quite a beating at the hands of government has softened its stance, perhaps recognizing that Confucianism are still be an effective instrument of social control. Confucian temples (particularly the ones at Qufu iin Shangdong province) are now being restored.